Security guards hired by a five-star hotel allegedly molested a girl and assaulted her family members last evening for failing to accept the demand of the hotel management to align her shop with the banquet hall of the hotel. The Municipal Corporation of Delhi has given approval for construction of a private road to Noida Toll Bridge Corporation, to enable the residents of Mayur Vihar to visit South Delhi. Changes in the Delhi unit of the Bharatiya Janata Party are in the offing after the installation of Dr Harshvardhan as president of the party and some younger faces are likely to find a place in the organisation. Speaking at a felicitation function of a Ramlila group in the city, the Congress MP from Karnal, Dr Arvind Sharma, said his party would get overwhelming majority in the forthcoming Haryana Assembly elections. The Congress leader Ved Prakash Vidrohi has described the announcement made by the Chief Minister, Mr Om Prakash Chautala, at a rally in Rohtak to provided apprenticeship and job opportunities to the unskilled youth, as “an election stunt” in view of the forthcoming State Assembly elections. Even as the government has asserted its commitment towards providing an education system with a long-term policy .so as to benefit the students, there have been countless allegations by parents regarding indiscriminate exploitation by the school authorities. The Chairman of the Standing Committee, MCD, Mr Mukesh Goel, yesterday asked the officers concerned to review the English books prescribed for primary school students of the corporation. A 17-year-old schoolboy has gone missing after failing to clear his internal examination. Depressed over his dismal performance in the school examination, Rajeev Ranjan has not been traced since October 13. The Delhi High Court today granted bail to industrialist Anil Nanda who was arrested on charges of evading payment of customs duty on goods worth Rs 54 lakhs while coming from London on October 13. The Delhi Government has recommended withdrawal of all the 35 cases of agitation and rioting against senior Congress leaders, including Union Human Resource Development Minister Arjun Singh and Uttaranchal Chief Minister ND Tiwari. An airline employee was crushed to death under a bus belonging to a carrier inside the Indira Gandhi International Airport today, the police said. The fault of the girl was that she had refused to remove her shop so as to make it part of the banquet hall of the hotel. The hotel management wants to convert the shopping mall into a banquet hall, alleged the victim. The management of the hotel feels that the shop will distort the beauty of the banquet hall, alleged the girl. Her family had bought the shop in the hotel five years back. Under pressure from influential people, the district police have remained a mute spectator inspite of being approached by the victim a number of times. A number of eyewitnesses, including 15 youths, have written a complaint to the Police Department in this respect. Even medical reports of the victims have failed to convince the Police Department to file an FIR against the culprits, said the girl, whose clothes were torn in the scuffle. She runs a placement consultancy agency from her shop at the Edmonton Shopping Mall at the Bristol Hotel for the last five years. Initially, there were around 50 shops on the first floor, but the management steadily converted most of the shops as part of the banquet hall. The management started harassing them so that they would ultimately close down their business, alleged Mr Vimal, father of the girl who helps run the business. The family members are “terrorised” and have kept themselves confined to their house in Sector 17, Gurgaon. During the last two months, we have requested senior officials including the Deputy Commissioner, Mr Anurag Aggarwal and the Senior Superintendent of Police, Mr Alok Roy, to help us, but nothing has coming out of it, said the father. However, a police official said the complaint against the Bristol Hotel management and its security guards are being investigated. We would take action as per the law of the land and would not succumb to any pressure, said Mr Balbir Singh, SHO, Sector 29 police station. The Public Relation Manager of the hotel, Mr Sanjeev Mehta, said that the shop was allotted for running a bookshop (stationary) and not for a placement agency. The unemployed youths visiting the shop were unnecessarily creating “scenes” in the hotel, added Mr Mehta. The Municipal Corporation of Delhi (MCD) has given approval for construction of a private road to Noida Toll Bridge Corporation (NTBCL), to enable the residents of Mayur Vihar to visit South Delhi. This is first time in the history of Delhi that a road will be owned by a private company. The land has been taken on lease from the UP Government and will be maintained by the MCD. It has been dubbed the “link road” and users will have to pay the company for using it. The Municipal Commissioner, Mr Rakesh Mehta, said that recent studies had shown that commuters from Mayur Vihar and adjoining areas travel to South Delhi using either the Nizamuddin Bridge or the Kalindi Kunj Bridge. The traffic on both the bridges in peak hours is close to saturation. Seeing the necessity of having an alternate route, the NTBCL had submitted a proposal to the Government of Delhi last year on the link road. The company has got the nod form the DDA, too. It will not be a public road, rather a private road, where people will have to pay money to drive their vehicle. The DDA also has passed the resolution. The Leader of the Opposition in the Standing Committee had opposed the proposal, pointing out that the policy was not in the favour of the corporation. The DMC Act also does not make an allowance for this kind of a road owned by a private party, he had said. Dr Harshvardhan had been brought in to replace of Mr Madan Lal Khurana after the party’s defeat in the last Assembly election in Delhi about a year ago. He has so far been working as a stop-gap chief but after formal elections to the post, despite opposition from an influential section of the party, he would certainly like to have his own team, BJP sources say. Moreover, this has been indicated by Dr Harshvardhan himself. ‘’There are no two opinions that changes in the state BJP unit are needed to make it a more effective organisation, and we will think over the matter in due course of time’’, he said. According to a very senior BJP leader of the Capital, changes were most likely to take place in the first week of November. Dr Harshvardhan said he would like to have more young faces in his team. ‘’There are certain people in the party who are not able to devote as much time to the party as required, so they will have to make way for those who are more energetic and can spare greater time for the party,’’ he said. Expressing his preference for youth, the BJP chief added that this did not mean that the old ones were incompetent. 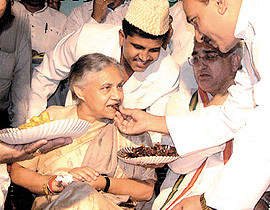 ‘’If Venkaiahji has been replaced by Advaniji, it does not mean that he was not efficient. But change is the law of nature. From time to time we have to infuse new blood to reinvigorate the organisation,’’ he said. The organisational elections in the BJP were completed early this month. The party’s defeat in the 2003 Assembly elections, followed by the Lok Sabha debacle in which the party lost all but one seat to the Congress and its recent defeat in the by-elections held this month has made its senior leader seriously think of overhauling the state unit to enable it to regain its former position in Delhi. Speaking at a felicitation function of a Ramlila group in the city, the Congress MP from Karnal, Dr Arvind Sharma, said his party would get overwhelming majority in the forthcoming Haryana Assembly elections. He said in the last Parliamentary elections, the Congress was ahead in 72 of the 90 Assembly segments in the state. In the Assembly elections, it would only better its record, he added. When asked for the basis of his assumption, he said that there was a strong anti-incumbency wave sweeping across the state. Simultaneously, there was a strong wave in favour of the Congress not only in Haryana but throughout the country, he claimed. The people in Haryana have now realised that it is only the Congress, which can deliver the goods. He further said that the masses have been let down by the INLD government as the poll promises made by the INLD have not been fulfilled. Rather, all sections of the society are reeling under crumbling law and order situation and corrupt practices indulged in by the various government agencies. In response to the HVP’s merger with the Congress, he said, “more the merrier”, as it will further strengthen the party. Referring to the Sutlej-Yamuna Link (SYL) canal project, he said that the Haryana Congress was well aware of the nuances of the problem and it had taken up the matter with Prime Minister Manmohan Singh and party president Sonia Gandhi, following the Punjab Assembly annulling the water sharing agreement with other states, including Haryana. In a statement here today, he alleged the problem of unemployment had worsened sharply in the past five years as the Chautala government had failed to fulfill its promise of providing jobs to the unemployed, particularly those in the rural areas. Allegations of flouting of rules by the schools and the ‘inability’ of the authorities to take proper action against the defaulters have also been common. In effect, there seem to be a gross ‘mess-up’ in the implementation of the rules and norms for the schools in the district. The ‘Faridabad Abhibhawak Ekta Manch’ (Parents Association), which has been taking up matters concerning the “exploitation” of the students and their parents by the school authorities, especially those in the private sector, has asked the Education Department and the local authorities to clarify its stand on the flouting of the much-hyped ‘Rules and Regulations’ announced by the State government in 2003. It was alleged that even as the Chief Minister himself had been stating that the new framework had been implemented, contradictory and confusing statements were being issued by the officials of the Education Department in the State. 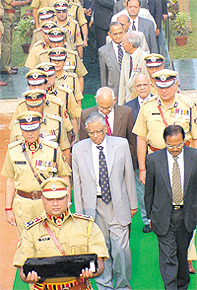 The President of the Manch, Mr O. P. Sharma, said in a statement here today that the officials concerned had informed them that the new ‘rules’ had been shelved by the State government for the time being, and as a result, the complaints regarding the violation of the norms and harassment of the students and their parents were not being attended to. He said a delegation of the Manch, which had recently met the district authorities in this regard, failed to get satisfactory response from them. According to Mr Kailash Sharma, General-Secretary of the Manch, with the onset of the admission process for the next academic session, the schools in the district, particularly those in the private sector, had started fleecing the parents by seeking ‘donations’ and other financial charges. In effect, the new ‘Rules’ and the policy framework announced by the government last year were being ignored. To make matter worse, the authorities have failed to take action to implement the ‘rules’ farmed by the State government. It was pointed out that the HUDA rules clearly mentions that schools receiving allotment of plots at concessional rates will have to provide 20 per cent reservation to the poor and backward students. Moreover, it was stated that the admission committees of such schools would have a representative of the HUDA. However, it was pointed out that policies regarding reservation of seats to the poor and backward students as well as prohibition of ‘donations’ have been flouted on a continuous basis by the schools in the district. It was alleged that the HUDA officials had even failed to take action against schools where “illegal constructions” had been done without their approval. In most of the cases, the HUDA officials had not gone beyond issuing “meaningless notices” to these schools. The Manch has called upon the authorities to take back the plots and buildings of those schools found violating the rules set by HUDA while allotting plots at concessional rates. The Chairman of the Standing Committee, MCD, Mr Mukesh Goel, yesterday asked the officers concerned to review the English books prescribed for primary school students of the corporation. The directive came after the Leader of the Opposition, Mr Vijender Gupta, raised the issue, saying that these books were so difficult that the students could not understand them. Mr Gupta had alleged that the Education Department of the corporation had introduced the books without considering the status of the students. These books are so difficult that the students cannot understand them. While prescribing the English books for 3rd, 4th and 5th standard, neither the practical English standard nor the knowledge of the students of these classes has been taken into consideration. The books are even tougher than the books prescribed in English medium schools, where English language is taught from pre-nursery to higher standards and spoken as second language in homes of the students. As against this, English is taught as one of the subjects in the municipal primary schools. The chapters for these books have been taken from high standard literary books published in the United Kingdom and the USA. The authors are Rose Fyfimax, Margeret Friskey, Dorothy Aldis, Arnold L. Shapiro, Alan Alexander Milne, Raymond Williams, Fleanor, Farjeon etc. On the other hand, the English books, prescribed in the central schools, have the chapters written by the Indian authors only. Quoting from the 3rd standard book preface, he said that children learn languages because they interact with people who use them in meaningful contexts. Further, the children who have the potential to engage in the delicate and complicate task of isolating the sounds of language, also have the capacity to build the sound alphabet relationship on their own. What really matters is rich and meaningful exposure. Justice H R Malhotra granted bail to the 52-year-old Escorts vice chairman after he furnished a personal bond of Rs 50,000 and a surety of like amount. Mr Malhotra further directed Nanda to surrender his passport and not to undertake any foreign tour without the permission of the court. Nanda had appealed against a session court order refusing him bail on the ground that the offence was serious and the accused was likely to tamper with evidence. The Directorate of Revenue Intelligence (DRI) had detained Nanda late on October 13 after a search of his baggage yielded foreign goods worth Rs 54 lakh. He had passed through the green channel without paying customs duty with five suitcases and two handbags. He was booked under various sections of the Customs Act for evasion of duty. The Anti Corruption Branch of Delhi Government has arrested one Naib Subedar for allegedly demanding and accepting a bribe of Rs 10,000. The accused has been identified as Beena Mehra, Naib Tehsildar, Mehrauli. On October 20, one Jag Mohan contacted the department and informed that he had repaired his old boring machine that was fitted 20 years back. But the local tehsildar, who visited the area, demanded Rs 20,000 from him and also allegedly threatened to file a case against him if he did not pay the amount. She was demanding the money on the pretext that Jag Mohan had newly fitted the boring machine and it was not an old one. Jag Mohan settled for Rs 10,000 and informed the police. “These cases were under our State Home Department which has accorded a kind of “no objection” for closing them. Therefore, we have recommended to the Lt Governor BL Joshi for dropping of these cases saying there is no need to pursue these cases because of their political nature,” officials said. The cases were filed in 1995 against these leaders when they were part of the Congress breakaway fraction, Congress (Tiwari), for allegedly leading a mob and breaking police cordon during an agitation. Besides shouting slogans against then Prime Minister PV Narasimha Rao, these leaders had led crowds which had pelted stones at security personnel, according to the FIR lodged after the incident. The Governor of Rajasthan, Mr Madan Lala Khurana, was the Chief Guest on the occasion of the fifth anniversary of Ekta Mission and the birthday celebrations of noted devotional songs singer Narendra Chanchal. The President of Ekta Mission, Pawan Monga, was applauded for his work and encouraged to do more for the people, especially the youth. A host of personalities, including Shatrughan Sinha, Sahib Singh Verma, Jagdish Tytler, H S Balli and Anil Bhardwaj, were present on the occasion. The Delhi University has notified that the Supplementary Examinations 2004 for B.Com Pass and B.A. Pass are commencing from November 5 and November 16, respectively, and the date sheets are available on the website. An airline employee was crushed to death under a bus belonging to a carrier inside the Indira Gandhi International Airport today, the police said. Balbir Singh, who was on security duty for Air Sahara, was hit by a bus used by Jet Airways to transport passengers inside the airport at 5.30 a.m., Deputy Commissioner of Police (IGIA) U K Chowdhury said. The driver of the bus, Sanjay Bhatnagar, has been arrested. He was taking the bus from a taxi bay to the departure lounge when the accident occurred near a parked aircraft. The body had been sent for a post-mortem examination and further investigations were on, Chowdhury said. The police said that a case of causing death by rash and negligent driving had been registered. Bhatnagar was taken for a medical examination immediately after the accident. He was not in an inebriated condition, the police added.